! Orange the World Park Run! 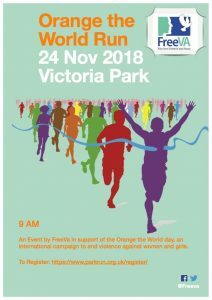 In support of the International Campaign Orange the World, and to raise funds for FreeVa, we are organizing a sponsored run by joining the 5K park run! Much like the work done at FreeVa, this campaign is set to end violence against women and girls and marks the beginning of the 16 days of action against gender-based violence. And what better way to start than with a run around the park?! The Facebook event is linked below so make sure to check it out and share with friends, family and neighbours so that they can join the run as well! There will also be a JustGiving page going live very soon, which will be posted on the event page.